The South Carolina boating safety course consists of 9 chapters. At the end of each chapter you can complete a 10-question test that covers all the topics from that Chapter, in preparation for your online boating license test. Since visual aids are so important for a large number of boaters, ALL of our boating license test questions contain fully illustrated images that help explain the concept. Test questions are SC DNR-Approved, Too! Just like the online course, every boating license test question that cover South Carolina boating laws have been reviewed and approved by the South Carolina DNR. Questions that cover all other boating safety topics are approved by the National Association of State Boating Law Administrators (NASBLA). Remember that questions on your boating license test will closely resemble questions that you encountered in your boating license practice tests. Review the boating safety study guide! Before attempting to take a boating license practice test, think back to the study guide. Were there any topics that were not 100% clear, or that you wanted to explore in more detail? If so, take a moment and go review that topic. Take your time! There's no need to rush through a test or quiz. There is no time limit when you are taking a boating license test, so be sure you read each question fully, and choose the best answer choice. Trying to rush through the test will likely cause you to miss important information. Review your answers! Each test in the boating safety course is presented one question at a time, but you can use the navigation grid on the right-hand side to move from one question to the next. Before submitting your test answers, take a minute to review all the questions. You might find a question or two where you'll want to rethink your answer choice. Taking the time to review the boating license test questions can mean the difference between a pass and a fail! Review previous tests! Before taking the final boating license exam which encompasses all chapter quizzes, take a minute and review those chapter quizzes. You might find very similar questions on your final test. Boating License or Boater Education Card...is there a difference? The boater education card is proof that you have successfully completed a boating safety course. 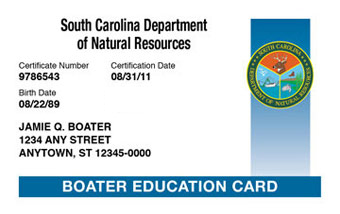 The boater education card does not expire and does not need to be renewed. Therefore, it is NOT a South Carolina Boating License!